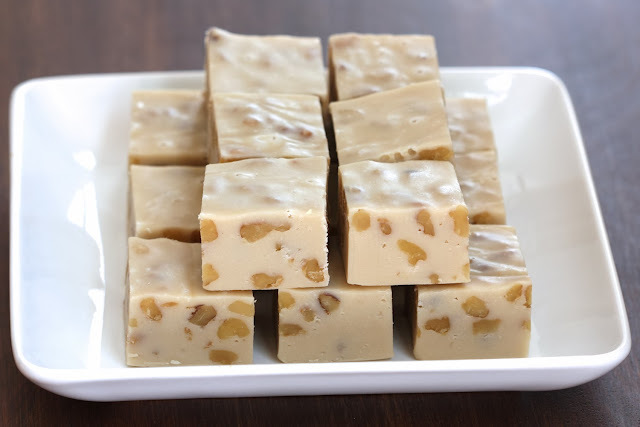 This Maple Walnut Fudge is my idea of fudge perfection: oh so sweet, fabulously smooth and utterly creamy, bright with gorgeous maple flavor and speckled with chunks of walnuts. It'll have your mouth watering and wanting for more. Fudge perfection. The only thing better than how this fudge tastes is how quick and easy it is to make! It's fast and practically fool-proof; you'll be on your way to sugary nirvana in no time. 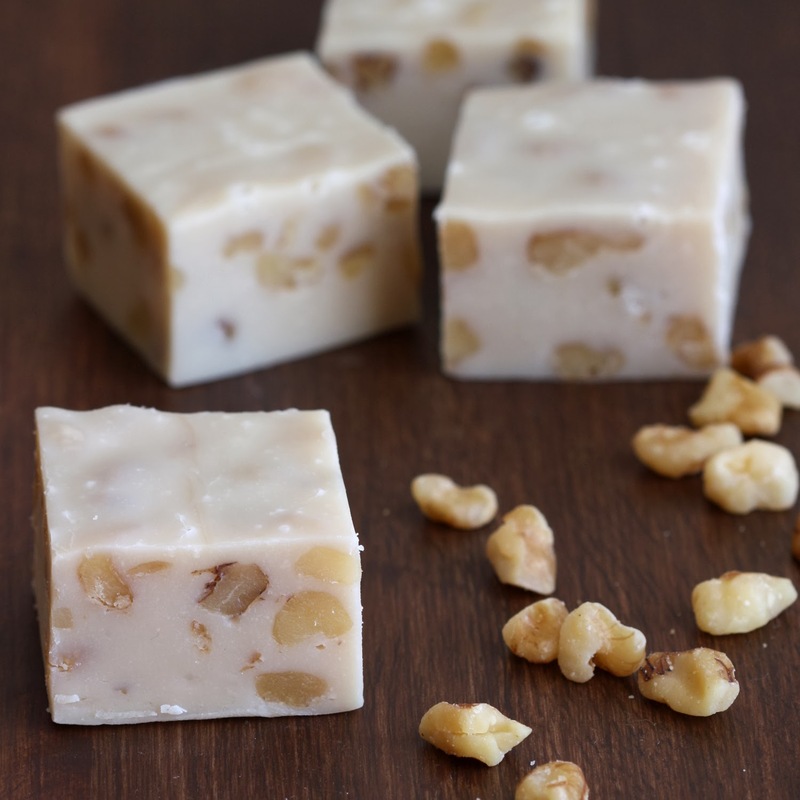 If you're not a fan of nuts, you could certainly leave them out of the recipe; though I do think they really add a nice texture and compliment the maple flavor beautifully. Walnut lover or not, if you like maple flavored treats, you really have got to give this fudge a try! Butter and line an 8x8 baking pan with parchment paper. Lightly butter the parchment and set aside. 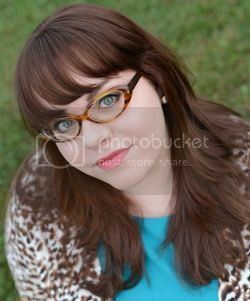 In a medium saucepan over medium-low heat, melt the white chocolate, sweetened condensed milk, butter and salt, stirring constantly. Once melted and combined, remove from the heat and stir in the maple flavor and walnuts. Pour the mixture into the prepared pan, even the surface, and refrigerate until set, 1-2 hours. 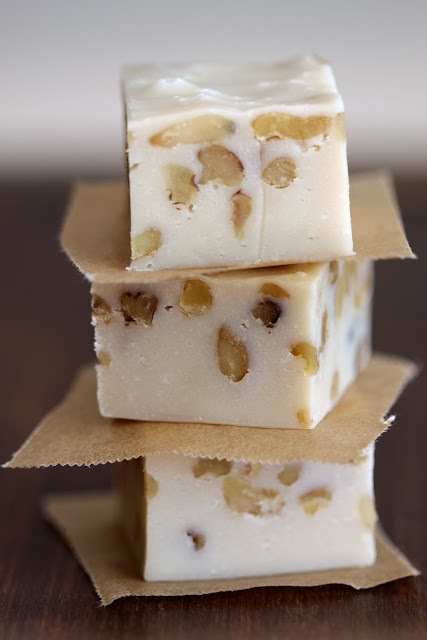 Remove the fudge by lifting the parchment paper, then cut into 36 squares (or more, if smaller pieces are desired). Serve immediately or store in the fridge or at room temperature for up to a week.